A comedy series from executive producer and writer Liz Meriwether ("No Strings Attached"), NEW GIRL features a young ensemble cast and takes a fresh look at modern relationships. 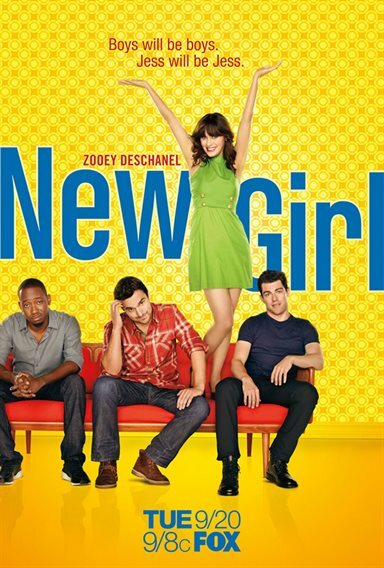 Download New Girl in Digital HD from the iTunes store. 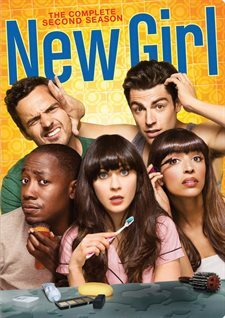 New Girl images are © 20th Century Fox. All Rights Reserved. I wondered how they were going to top the first season of "New Girl" but they managed to make this second season even better. "New Girl" is easily one of the best comedies on television right now. It is hip, funny, packs a great cast and some amazing writing. There is perfect balance of comedy and drama as well in this season. Zooey Deschanel, Jake Johnson, Max Greenfield, Lamorne Morris and Hannah Simone are amazing together. They each work off each other, clearly working more off the cuff than from the script most of the time and it works so well. Season three is already off to a great start and I can't wait to see what they have planned. Official Premise: The romantic tension between Jess (Emmy Nominee Zooey Deschanel) and Nick (Jake Johnson) escalates in the hilarious, quirky second season of New Girl – but will they ever hook up? Meanwhile, Schmidt fails to be hip, Winston isn't "prepared" for a hot date, and Nick faces a death in his dysfunctional family. While Jess does her best to replace Cece on a modeling job and a drunk Elvis impersonator at a funeral, Schmidt and Winston hope to rearrange Cece's arranged marriage. Season two packed 25 amazing episodes and featured some guest stars like Jamie Lee Curtis, Rob Reiner and Dennis Farina. I loved that Curtis and Reiner played Jess' parents, they were really cute together and really added a lot to the episode. Farina also delivered a great role as Nick's dad, who ended up passing away on the show (and also in real life this year). He is a great actor and was a great addition to the show, adding another layer to Nick's character by giving us a fuller view as to why Nick is who he is. I also loved David Walton (TV's short-lived "Perfect Couples") as Jess' doctor boyfriend. He was funny and meshed very well with the rest of the cast, it's a shame they didn't extend their relationship a little farther as opposed to pushing Nick and Jess together as they did by the end of the season. It would have been interesting to see the plotlines the writers could have developed out of that triangle. This show is just filled with so many great one-liners, I'd imagine it's only a matter of time before a website pops up with nothing but quotes from the show. Would be very popular with me for sure since there are a lot of times the cast delivers the dialogue so quickly that I miss what they say. It's a shame Fox didn't give this show the Blu-ray treatment that would have been a lot more enjoyable to watch. While the season does pass well on standard DVD, the difference in quality is so obvious after watching Blu-ray for so long now. The video looks clear but lacks any kind of pop to colors, blacks look a little dull and at times some scenes come off a bit grainy. The audio does present well in a Dolby Digital 5.1 sound. No surround sound, but given this is just a sitcom, there's really no need for anything that fancy. Extended/Unrated version of the season 2 episode "Virgins" in which the characters each tell their stories of how they lost their virginity. Audio commentary on the episode "Cooler"
The second season has the ensemble cast playing off one another with expert comic timing. The show feels much fresher than that because of the tight-knit cast. While Zooey Deschanel might lead the cast, it is Jake Johnson (Nick) and Max Greenfield (Schmidt) who dominate the cast. They play their characters with an exceptional blend of verbal and physical comedy that makes them seem like real people living in a world where the absurd is commonplace. Both Johnson and Greenfield have moments where they must play their characters with a stronger dramatic bent (usually hurt, deeply) and they make the viewer empathize with their characters. They are the heart and soul of New Girl. While Jess (Zooey Deschanel) might be the face of the show, the comedic and dramatic gravitas comes from Greenfield and Johnson. Lamorne Morris and Hannah Simone are given more to do in this season and while they rise to the occasion, they do not perform in a way that confounds the viewer's expectations of them. Regardless, New Girl shows solid growth in its second season and is consistently funny, making it one of the few "must watch, must buy" DVD sets from the 2012-2013 television season.